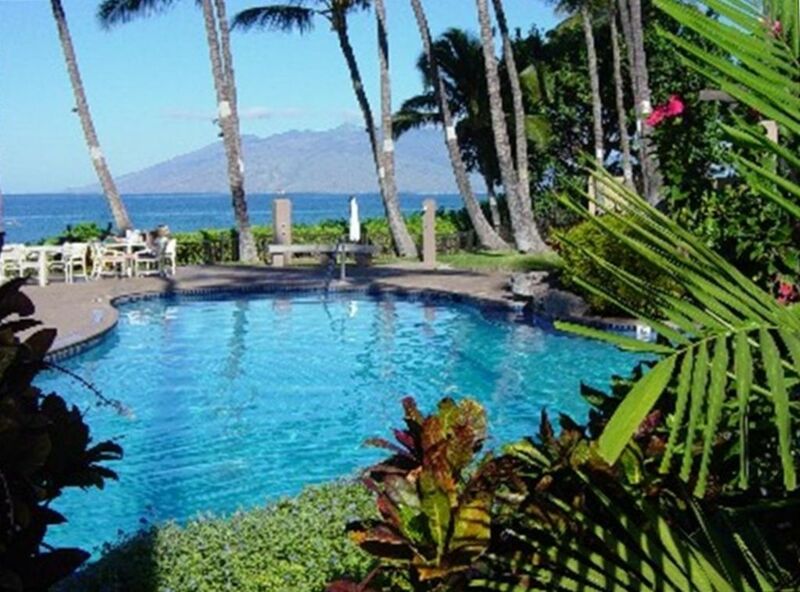 Located in Wailea Ekahi with a beautiful Ocean View, our condo is in a lush, tropical garden setting, literally right next to a lovely, secluded, quiet pool and just a 5-7 minute walk along a grassy path to Keawakapu beach. Large, clean and well-cared-for 1550 ft. condo has 3 furnished Lanais, and 2 master bedroom suites each with a private granite and travertine bathroom with Grohe fixtures, Koa wood cabinets, etc. Premium quality beds, towels and bedding include 1 CA King bed, 2 new pillow-top double beds in second bedroom, and 1 queen sleeper sofa in living room. Walk in your bare feet down the grassy path to the ocean, no streets to cross, and you'll find one of the best beaches on Maui that's great for snorkeling, boogie boarding and swimming. Complex has a wonderful beachside pool pavilion complex with locker room facilities, BBQ area, kitchen and lovely, heated family pool. Condo is beautifully decorated with Hawaiian themed fabrics, local artwork, Hawaiian Quilts, teak and rattan furnishings, a new granite and stainless very well appointed kitchen, gas BBQ, new washer/dryer, new wall to wall carpeting, and so much more. Perfect for family vacations with a 46' Sony Bravia flat screen HDTV in the livingroom, and a Home Theater sound system, DSL, WiFi, 2 DVD players, TV's in the bedrooms, Ipod docking IHome clock radios, and a stereo system. We love to watch movies in the evenings and often make dinners and entertain in the condo. So we have nice dishes, matching sets of red, white and other wine glasses, quality cookware and appliances, and matching cutlery so you can set a nice table and enjoy cooking and dining in your own home. We are also well stocked with beach towels, board games, books, boogie boards, beach chairs, and beach toys. So just bring your bathing suit and flip flops. Just about everything else you'll need is here. Walk along the beach to 5 star resorts and restaurants. We are just across from the 13th hole of the Wailea Blue Course (on the ocean side of Wailea Alanui). My name is Lisa and I live in Orinda California with my family. Please contact me about our lovely Maui condo either at home: 925-253-1568, or 925-980-2390. We love Maui because of the weather, the beautiful scenery, plants and flowers, relaxed Hawaiian life-style, and of course the wonderful beaches. We had been vacationing on Maui since 1984 and once we found the Ekahi complex we knew that this was 'as good as it gets'. So we began coming to Ekahi exclusively, and bringing our children, parents, friends and extended family too. As we began thinking about a second home and a retirement spot, Ekahi was the only place we would consider. So when we could afford it we purchased a 2 bedroom place here. We have been upgrading and remodeling it, and really made it as perfect as we can. We keep it in excellent condition and go there as often as we can ourselves. We love this condo and think you will too. We have many repeat guests who come back time and time again. We are 30 feet from the private and quiet 'upper pool', and a 5 minute walk to a wonderful beach with very good snorkeling. You can swim, snorkel and boogie board right at our beach. The Ekahi complex is stunning with gardens and a golf-course quality grassy fairway throughout, fruit trees, exotic flowers, and 4 swimming pools. One pool is beach-side with a BBQ area, oceanside kitchen, and shower areas/locker rooms, as well as a very large, shaded beach pavillion. Our place is set back from all the road noise and traffic so that it is very quiet. We have lovely views including a panorama of the ocean from the main sliding glass door in the living room. Our Lanais are very private and quiet spots for contemplation, reading and napping. Because we have a breathtaking ocean view, a propane gas BBQ and a dining area on the main Lanai, it is where we spend a lot of time. We have our meals there in the evenings, and can sit outside on the Lanai and watch the sunset. With Hawaiian quilts and tropical fabrics, local artwork, sliding screen doors and ceiling fans in all rooms, our condo has a very relaxing Hawaiian feel to it. 2 Full bathrooms each with vanity and dressing area separated from shower/toilet area in each. Keawakapu Beach is one of the most beautiful beaches in the world. Walk to beach along grassy fairways with no roads to cross, private gate at edge of complex onto beach. Beautifull views from all windows. Cannot see any roads or cars, only ocean and garden. Very peaceful and quiet. Premium quality, high thread count linens and lots of plush bathroom and beach towels. New side by side, and freezer with ice and water dispenser. Stainless GE Convection glass top range. Blender, Food processor, spices and misc housewares are on hand. Just like home. We have a 46 inch Sony Bravia flat screen Hi Def TV and a Music System in our living room, and TV's in the 2 bedrooms. Board and card games, Scrabble, chess, puzzles, etc. Across from 13th hole of Wailea Blue Course -- Wailea Gold and Emerald are also nearby, as is the Makena course. We are on the second floor and so you must be able to climb a flight of stairs for entry. No lifeguards are on duty at pools or beach. Very private and lovely spot. Beautiful view of Ocean and surrounded by tropical gardens, birds, and flowers. Right next to Upper pool. Relaxing and peaceful place to vacation. This is a great 2 bedroom, 2 bath condo and was quite spacious for me and my husband and my mother. An ocean view and beautiful flowers surround the main deck. Two other couples who stayed in 1 bedroom ground floor units praised ours as being light, open with a great view to watch the sun set every night. Lisa was great to work with and allowed us a late check out that accommodated our flight schedule. We stayed here in July 2018 and enjoyed it. The location is great- easy access to Kihei and Wailea when we wanted to eat out, and a few minutes’ walk to the best swimming beach with the softest sand and mild swells. The complex has three pools- one big one for families and two quiet pools, and this condo is close to a pool. The family pool is right by the beach and everyone was friendly there. The condo is a quiet place to land and has two big bedrooms with attached bathrooms that have updated showers. The beds and pillows were very comfy. It was easy to cook meals with a complete kitchen. The booking process couldn’t have been easier and Lisa was very friendly, proactive and accurate in her communication. Thanks Lisa! Incredible location and beautiful condo with all the amenities for indoors and outdoors. The property was lush, tropical, secluded and quiet. The walk down to the beach was beautiful. Loved the beach equipment provided including snorkeling gear. Glad you had a fabulous vacation. We look forward to hosting you on your next visit to Maui. A wonderful Ekahi condo for the whole family! Lots of room for a family of 4. A wonderful place to stay at Ekahi Village. Loved the view of the living room lanai out to the ocean. Comfortable furnishings and lovely art abounds. Plenty of good music, books and utensils as well, plus snorkeling gear, boogie boards etc. Lisa was very helpful and kind. A great stay! Thank you for your kind words and for taking such good care of our place. Hope you can return next year and take advantage of our discounted prices for repeat guests. This was our fifth time to Maui but our first time in Wailea. As usual I did much research but there's always a leap of faith when renting a condo. After a long day of travel and Avis managing to misplace my car, we finally arrived. From the first turn of the key this condo exceeded our expectations. The condo was clean and well appointed with interesting artwork on the walls. We especially liked the floorplan and it has three lanais (patios). The main lanai has a gas grill. The condo is in a quiet area of the overall property. We liked that the pool was very close and yet secluded. Parking was close and easily accessible. Lisa goes out of her way to make sure you have everything you need and she includes recommendations on restaurants and other activities. There's a nicely stocked book shelve, including several guides on Maui hiking trails which we used for our day trips on the island. The property is ideally located in Wailea on beautiful Keawakapu Beach and is within walking distance of various restaurants and shopping. You will enjoy the absolutely stunning beach and can walk for miles in each direction. We snorkeled and boogie boarded as much as possible. The beach never really got crowded. You will not fully appreciate this until you take a drive north into Kihei and you will see the mass of humanity crowding the Kam I, II and III beaches! The pool facilities were clean and well maintained and the grounds crew does an excellent job. Make sure you find the lime tree and pick one to enjoy. Mahalo nui loa to you Lisa for your hospitality and such a beautiful condo! Thank you for your kind words, it was a pleasure to host you and your wonderful family. Wailea has almost perfect weather year-round, sunny and warm almost every day! Our Keawakapu beach is also one of the lovliest in the World and you can walk right down the hill to it from our place. This is a smoke free property, no smoking please. If there is an emergency or serious illness that interferes with your previously reserved vacation dates, contact us and we will work with you to try to reschedule to mutually acceptable alternative dates. There is a $500 rebooking fee - as your originally scheduled dates will probably not be able to be re-rented on short notice.